Bluebonnet season draws millions of visitors to Hill Country every spring for country drives, festivals, and wine tasting. During the second week of April, the town of Burnet, officially designated bluebonnet capital of Texas, hosts an annual bluebonnet festival. But besides spring festivities and the highly anticipated extravaganza of blooming fields of blue (red poppies and Indian Paintbrush too), the surrounding Highland Lakes region is a year-round destination for outdoor recreation. A quick hop from Austin and San Antonio, the Highland Lakes of Burnet County comprise Lake Buchanan, Lake Marble Falls, Lake Travis, Inks Lake, and Lake Lyndon B. Johnson. With a quiet atmosphere that feels worlds apart from nearby city-life, the region is touted as a retreat for families and friends to unwind and unplug. Several lake resorts offer activities from kayaking, fishing, and ecology cruises to nature hikes, sunrise-yoga, and wellness programs. 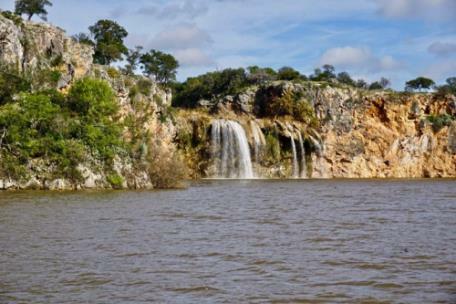 Nature-based activities are the thrust behind the area’s most popular resort, Canyon of the Eagles, situated in a 940-acre park along the shores of Lake Buchanan. As the name implies, the location is a migratory home for the American bald eagle (from fall to early spring). The resort is described as a place to “jump out of the box and into nature,” says Cindy Bower, resort president and CEO. Amid the serenity of Canyon of the Eagles’ protected environment, you may find a bit of adventure and childlike wonder, as I did recently while taking part in the resort’s educational and interpretative programs, which include “Owl Prowls," a hands-on reptile program, and stargazing at Eagle Eye Observatory. Thanks to minimal light pollution in the remote parkland and an elevation of approximately 1,100 feet above sea level, the observatory’s dark sky location is considered one of the best astronomic viewing sites in Texas. The stargazing experience includes barreling down a pitch-dark gravel road on the back of a golf cart and walking along a dark-friendly path to an open-roof structure, where you’ll peer though high-tech telescopes to identify constellations and planets. Chief astronomer Jim Sheets explains the set-up and allows participants to look through several telescopes of varying lengths. Some have computer enhanced imaging and astronomical instruments with Go-To targeting. On the night of my visit, our celestial experience included seeing a vibrant Milky Way, several common constellations, and the bright planets Saturn, Jupiter and Mars. On our return golf cart ride back to the resort, we spotted a grey fox at the edge of some woods, his eyes slyly peering at us in a faint moonlight. The park is home to many wildlife species, including deer, armadillos, roadrunners, feral hogs, bobcats and more. The 62 cabin-like guest rooms have porches, rocking chairs, and a rustic ambience. There are no TVs in the rooms, though there is one in the resort lounge and Wi-Fi throughout the property. 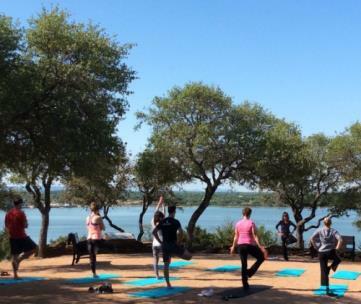 With hiking trails, a pool, wellness and program activities, the resort is well set up for families and as a destination for small group retreats. All meals are served in the scenic Overlook Restaurant, which boasts award-winning cuisine with fresh, local ingredients and seasonal fare. 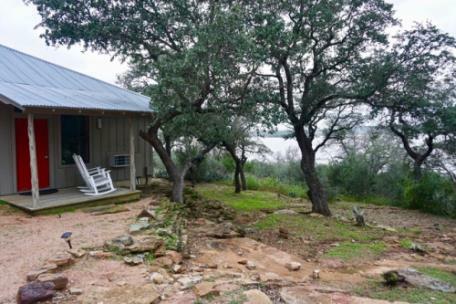 Various types of accommodations are found throughout the Highland Lakes region. 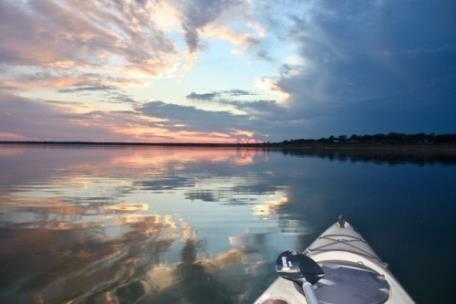 Another Lake Buchanan favorite for its peaceful setting and simple, clean lodging is Painted Sky Inn, situated on a quiet cove along the eastern shore. The 50s-era inn has been freshly painted and modernized, offering rooms and suites with kitchenettes, and all have outdoor access and lake views. A lounge stocked with coffee and snacks features a large deck for relaxing and enjoying the “painted-sky” sunset hour. 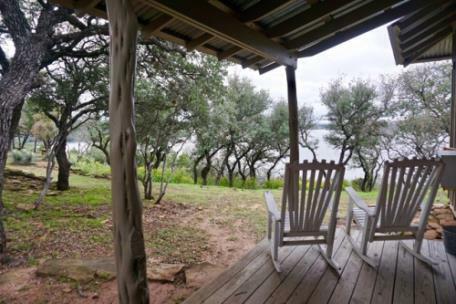 Log Country Cove on Lake LBJ offers 36 premier cabins and grand log homes from 1-7 bedrooms on expansive lakefront property. Ideal for self-catering guests, many homes have private pools and hot tubs, and there is a clubhouse for gatherings and catered meals. Activities include boating, swimming, kayaking, and hiking. A delightful way to learn about the ecology of the lakes region is to take the two-hour Vanishing Texas Cruise, which offers a narrated tour and introduction to the natural habitat of Hill Country. Operating year round, the 150-passenger Texas Eagle cruises across Lake Buchanan and into the Colorado River for scenic views of waterfalls and cliffs, with hopes of spotting of bald eagle and other wildlife. For time off the water, the quaint towns of Burnet and Marble Falls offer downhome eateries and shopping. 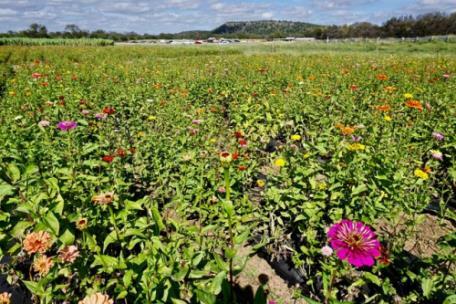 If you enjoy pick-your-own produce, you’ll want to stop at Sweet Berry Farm near Marble Falls for pick your own zinnias or strawberries (seasonally). 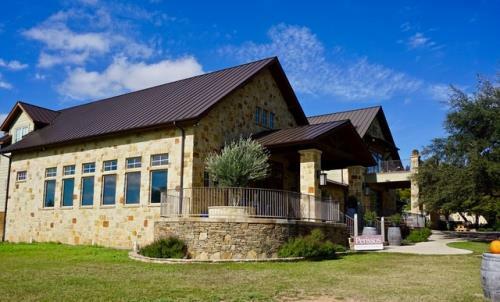 The Highland Lakes Wine Trail includes more than a dozen wineries that offer tours and tasting. Some have won international awards and grow their own grapes for a variety of wines including Tempranillos, Cabernet Sauvignon, Chardonnay, Chenin Blanc and Merlot. Three top wineries for world-class wines and wonderful scenery are Perissos and Torr Na Lochs in Burnet, and Fall Creek Vineyards in Tow. 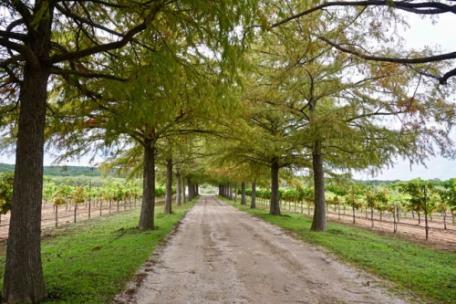 Fall Creek was founded in 1975 by one of the first families of the Texas wine industry, and they continue to grow their own grapes and source from other farmer-owned vineyards throughout Texas. The Highland Lakes Beer Trail, though not as long as the wine trail, is equally impressive with unique breweries such as Save the World Brewing Company, which gives 100% of profits to charity. Since 2012, the company has been crafting Belgian-style beer as the first 100% philanthropic craft brewery in the U.S., with the motto, “Saving the world, one beer at a time.” Cheers! To Highland Lakes and the region’s growing craft brew culture.